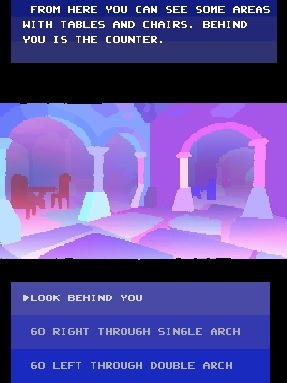 Multiple choice your way through the dungeon looking at art and meeting characters. Not really any puzzles but you can take a wrong turn. Short! It takes about five minutes to go through and maybe a couple of trips to max out all it has to offer. Not really one for replays, once your done your done. But this is a bullet point so that's good right? Once the text has finished appearing at the top of the screen you can choose an option from the bottom of the screen using various input methods depending on the version. If nothing is happening then make sure the game is active by clicking on it. I wrote it to accept touch input but don't have a lot of control over how mobile browsers choose to display it. Selections will be made when finger is removed so you can slide up and down to reach selection of choice. Or use arrow keys up and down and space to select on computer keyboard. Or use the mouse to click on menu boxes. Joypad seems a bit hit or miss as to weather it's detected. Mouse appears to work best. Click download from the link below to get the spectrum version. 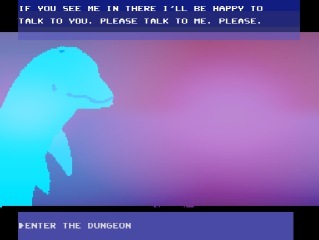 The spectrum version is supplied as a tap file. You will need additional software or hardware to run this file. The tap file my be loaded into the zx spectrum emulator of your choice. There are many emulators available for different operating systems and devices. The tap file may be transferred to a sd card for use with a divmmc device should you have one. May be portrait or landscape. Click download from the link below to get the android version. To get the apk installed on your android device you will need to give security permission to install from unknown sources other than app store. The app needs permission to modify/delete data. Clicky clicks dungeon appears in the Obsolete Technology event/exhibition November 10th 2018. part of the Conjunctions project. Clicky click and some of his computer graphics were created some years ago for an unfinished zine. This version was created over a couple of months. It borrows code from a slightly more involved project I started last year. With the modern cross platform code made in agk and a parallel retro development for the spectrum. When you click on the download link you will be prompted to make a donation. This can be zero though. Please don't not play it because you feel like you should be paying. Popularity and Feedback is also considered when I decide which projects to pursue in future. If you want to see more interactive stuff from me like this then be sure to play and share links to this page. As I'm experimenting a bit and dipping a toe into developing this kind of stuff. You can follow what I do next on twitter @s_daly. Thanks for playing.